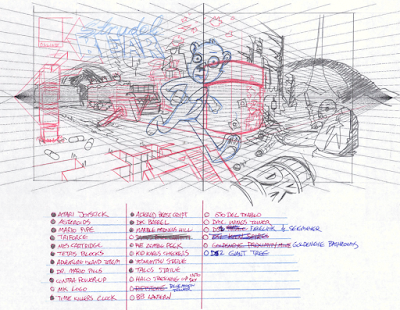 Grabbed a 2-point perspective gird and roughed out the idea of Strudel Bear running past classic video games and into current-gen games. Since this was a banner for my friend's twitch.tv page, he provided me a thorough list of his history of favorite games going all the way back through the annals of video gaming, and I did my best to incorporate elements of them all into his banner. 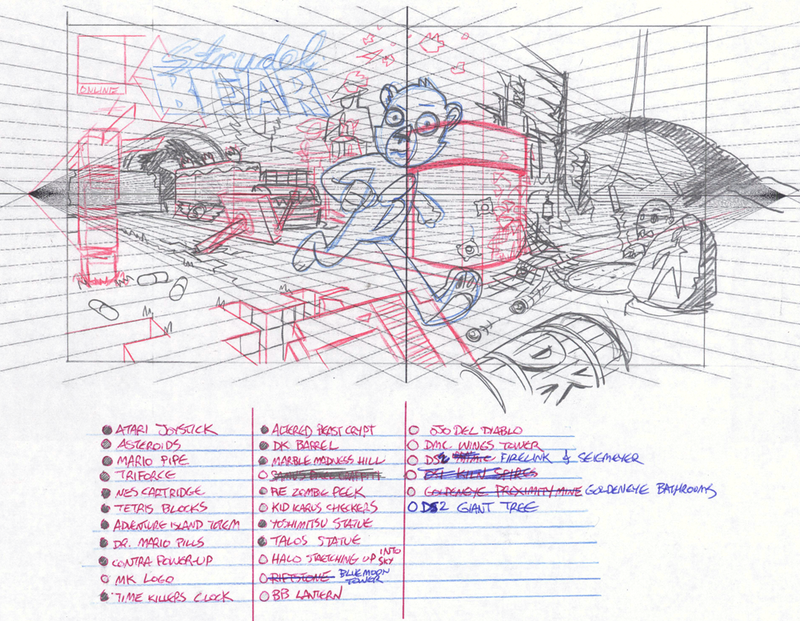 Most of the major video game elements are part of the checklist I included under the rough layout, although the list expanded and changed depending on what I felt was working and what wasn't as I got deeper into the process. This banner is WIDE. W-I-I-I-I-I-I-IDE. This is the widest piece I've ever drawn. It's much wider than my rough. I knew this when I was sketching out the rough, as it was more for just hammering out the idea of the piece. The image area twitch's website allows for banners is very wide. When it came to some of the more iconic, specific elements of video game-dom, I decided from the start that I would nail them more successfully by just pasting them into the image (Throat of the World from Skyrim, the Resident Evil zombie, the 8-bit faces of the Adventure Island totem pole, etc). This is what I committed to two 11"x17" bristol boards (smooth). I had to keep in mind the fact that a lot of work was going to be completed digitally, so I tried to only ink what needed to be included before scanning the art and completing the remainder in photoshop. You will notice there is no Strudel Bear jumping over the barrel yet, and that is because I drew him completely separately after I finished coloring this piece, and added him in last, along with the Strudel Bear logo. Here are the leveled, cleaned up inks, with the remainder of digital effects added in such as a half-opacity texture on the Mario Bros. pipe, the Asteroids game in the sky, the size and placement of the Hillfigure Knoll figure was adjusted, the top of the Donkey Kong barrel was tweaked because it was too flat in my inks, and I added the cypher messages on the stone slab from FEZ (below the giant crow). The writing on the left of the slab says, "ARTWORK BY KARL SAVAGE DOT COM," and the writing on the right reads, "THE CAKE IS A LIE," which is a reference to the game Portal. Lover of circles and gusto. All Artwork © Copyright 2014 Karl Savage. Simple theme. Powered by Blogger.